Well here we go again, yet another pizza review of yet another great Omaha pizza place. 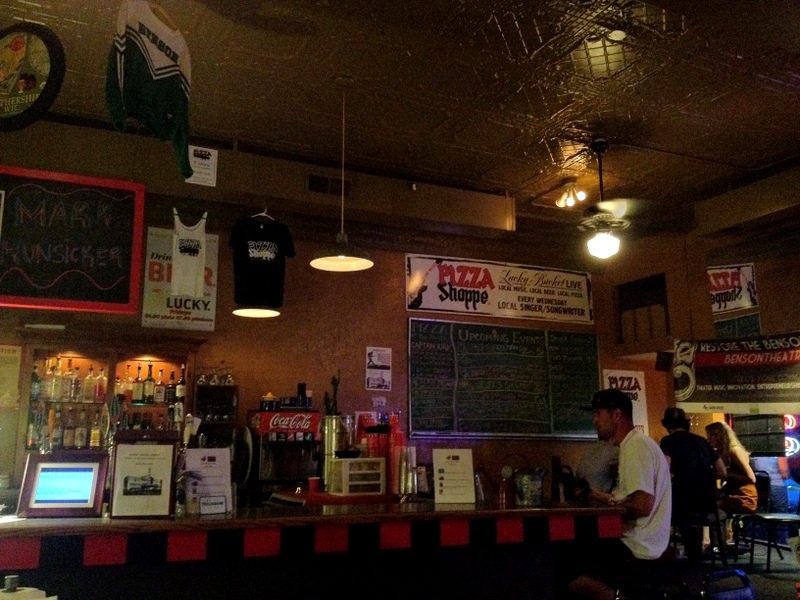 Our latest visit was to The Pizza Shoppe and Pub in the hopping Benson neighborhood of Omaha. You’ll find no shortage of young kids, bars, shops, restaurants and stop lights in the 6 blocks or so along Maple Street and we are pleased to say, one damn good pizza place. On the menu tonight was garlic bread with cheese, The Bomb pizza, a Spring Chicken pizza and somewhere between 1 and 4 pitchers of cold PBR. 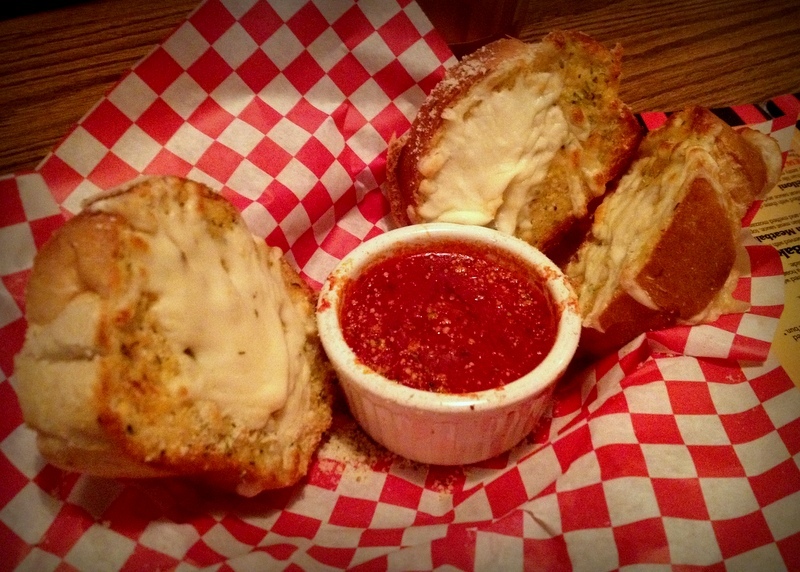 Our appetizer was delivered quickly in a basket and contained four large chunks of French bread brushed with garlic butter and loaded with stringy mozzarella cheese. It also comes with a bowl of some dynamite tasting marinara for dipping. This was some of the best garlic cheese bread that we’ve had in some time. The bread was thick and chewy with a strong flavor of the garlic butter. Our pizzas arrived soon after and were served on aluminum pizza trays. The Bomb pizza features an Alfredo base, chicken, Canadian Bacon, jalapenos, pepper jack cheese, extra mozzarella cheese and the implied promise of clearing your sinuses. We decided to try it two ways, half with the Alfredo base and half with the standard marinara base. The second it was placed on our table one of the Pizza Cousins said, “It smells like fire!”. Well it tasted just like it smelled: spicy. And really, really good. I’m certainly a fan of the meat pizzas as well as liking most things spicy. This single pizza aligned most of my stars. There was no shortage of chicken, Canadian bacon and cheese here, and then there’s the heat. 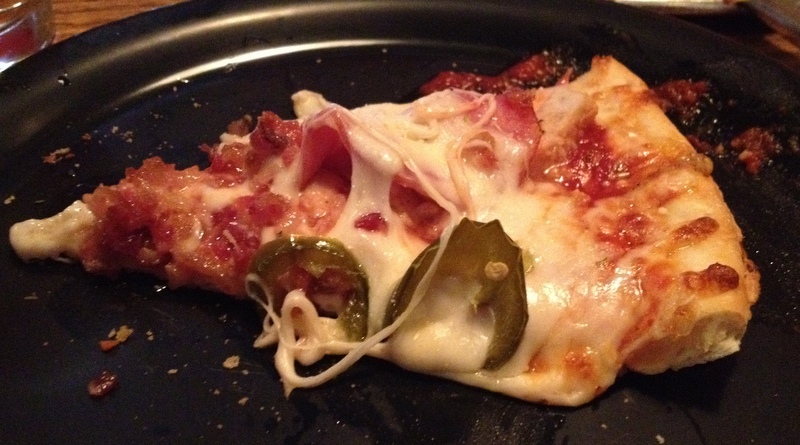 The combination of the pepper jack cheese and jalapenos sure brought some spice to the party. I think that may have led to an extra pitcher or two. Of the two sauces we tried on the pie, I was more of a fan of the tomato based sauce. The Spring Chicken pizza was equally unique and tasty. 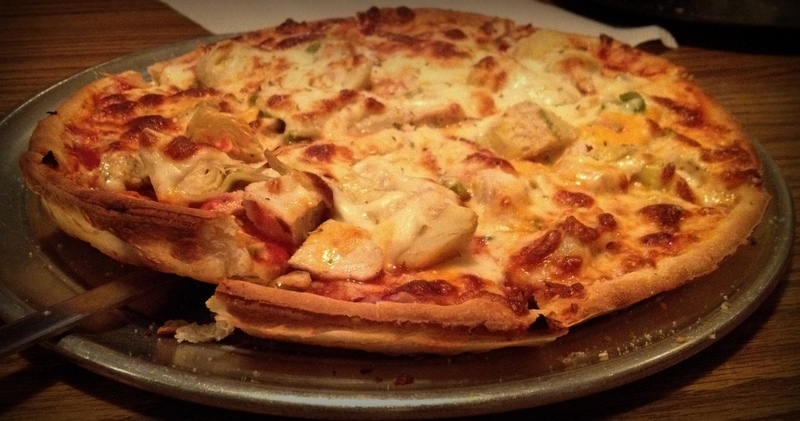 It features chicken, artichoke hearts, green peppers, red onions, cheddar and mozzarella cheese. There also seemed to be a light dusting of parmesan cheese on top. 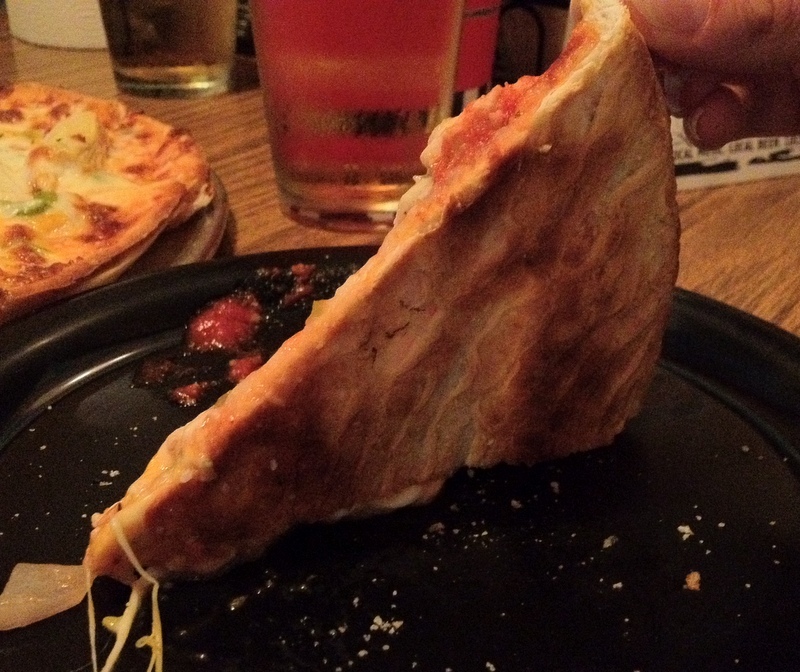 Both of the pizza had plenty of toppings and were extremely good in our opinion. The combination of their dough and the Baker’s Pride deck ovens turns out crusts that are flaky yet chewy. The crusts are thin, but like a good bra, very supportive as well, which is different than most other thin crusts that we’ve had. 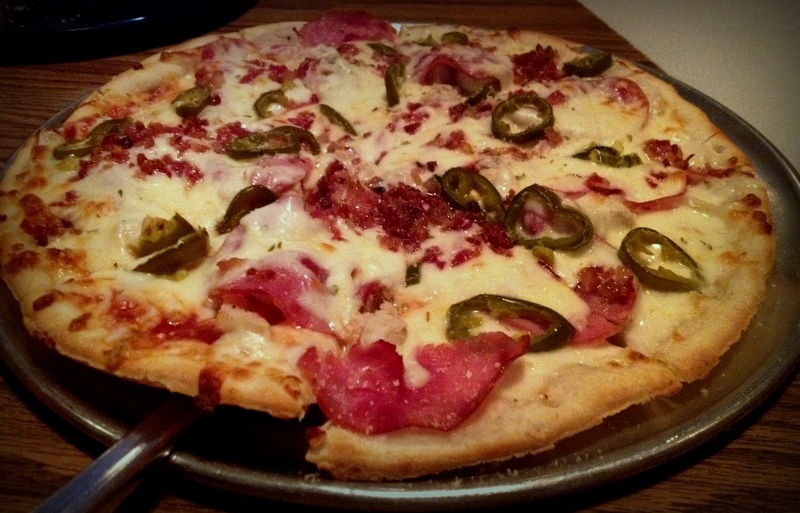 Overall we give The Pizza Shoppe very high marks for the quality and affordability of their food and drink. For those who live out west and choose not to venture too far past 72nd street, do yourself and favor and spend an evening with friends, good pizza and cold beer at The Pizza Shoppe in Benson. You’ll be glad you did. The bad: We can’t think of anything! How would you rate The Pizza Shoppe and Pub? Click on the stars below! This entry was posted in Pizza and tagged The Pizza Shoppe. Bookmark the permalink.